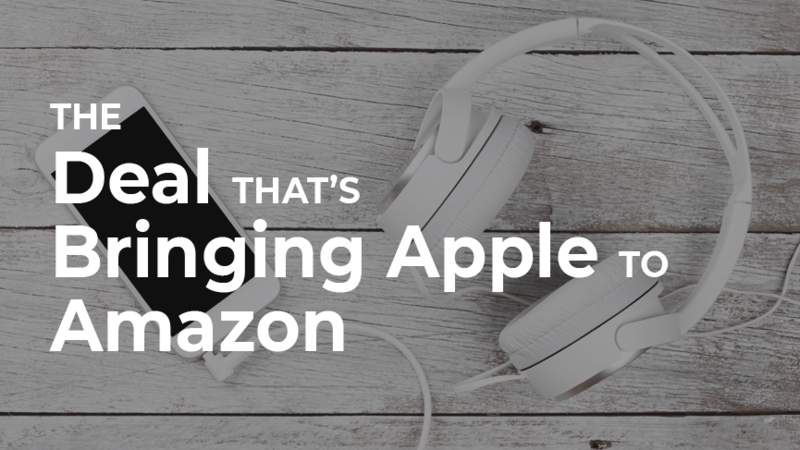 Amazon and Apple recently confirmed their new partnership, announcing that Amazon will now ship Apple products directly from Apple – including authorized Apple retailers. Up until now, the only Apple products sold on the platform were sold via third-party sellers. And those sellers are now learning to deal with the consequences of this new partnership. What does the agreement with Apple mean for third-party sellers? For starters, it’s important to note that this agreement is impacting only the sellers engaged in retail arbitrage. It doesn’t affect private label products. Many Amazon FBA sellers get their start in retail arbitrage, flipping deeply discounted products for profit. They shop around online, or in brick and mortar stores, buying products at a low cost and then reselling them on Amazon at a higher price. But when it comes to retail arbitrage and name brands like Apple, fake products flooding the market are a problem. With a massive brand like Apple, there’s an even greater risk of running into knock-offs. In 2016, as much as 90% of all “Apple” devices being sold on Amazon weren’t genuine (think accessories like iPhone chargers). This new partnership will effectively shut down the entry point for counterfeit products, ensuring that any Apple product we buy on Amazon is, in fact, an Apple product. It guarantees fair pricing, quality control, sufficient inventory, and promotes the integrity of the Apple brand. Conveniently, this new agreement started to take effect during the busiest shopping week of the year. In the coming days, more and more Apple products will be added to global Amazon marketplaces, and sellers have until January 4th to become an authorized Apple retailer. Otherwise, their listings will be taken down. Don’t get caught up with reselling major brands! Not all sellers are equipped to play with high rollers like Apple; quite often, private label selling is the better business opportunity. Why not find a product with high demand and low competition, and source it yourself! Luckily, we can help you with that, as Jungle Scout is the #1 resource to find, source, and launch a product on Amazon. You can even start the journey now, by going through the steps below. There are a ton of free resources at your disposal, right here on our site. We break down the basics of Amazon FBA selling, giving you a solid foundation of seller knowledge. Then we back that up with even more resources! Once you have a good grasp on the concept of private label selling, there is a wealth of information packed into the webinar below. In just 48 minutes you’ll have an idea of what you’re getting into. Selling private label products may require a lot of setup, but it also has the potential to produce some amazing rewards. You can dig even deeper, following every step of the launch process from finding a product to running successful ad campaigns. All you need to do is get caught up with our Million Dollar Case Study. This is our 4th installment of the series, and our objective remains the same: launch a product on Amazon while providing in-depth, transparent coverage of what we do to make that happen. Many new sellers have used our case studies to show them how to successfully launch a product, either using it as a guide or following along in real time. And because we recap every case study ‘lesson’, you can follow along at your own pace. Okay, so maybe you don’t want to jump through hoops to become an authorized Apple retailer. And maybe you’re not quite ready to dive into private label selling either. No problem! You could also try selling wholesale, as there are several advantages to choosing this particular selling method. Requires you to have a wholesale license (check for your specific country or state!). Requires you to build strong relationships with brand owners and manufacturers. Has pricing that is more controlled; you’ll need to negotiate the price with each manufacturer. Second, when it comes to selling wholesale, price wars with your competitors are unlikely. That’s because retail prices are generally standard across the board. Finally, selling wholesale means you’re not launching a new brand. Unlike private label sellers, you won’t have to create a new Amazon listing or try to add value to a product within a profitable niche. You can simply capitalize on a ready-made, success-proven product. Is this business model worth it? Finding manufacturers (the brand owners) who aren’t selling directly on Amazon already. Finding brand owners who don’t require high order quantities. Starting from square one as a new seller and establishing your business as trustworthy and professional. On a positive note, the same product research tips for finding private label products to source and sell also applies to finding a product for selling wholesale. And you can still utilize the Fulfilled by Amazon benefits the same as if you’re selling a private label product! The key to success is knowing how to research effectively, getting really good at negotiating with manufacturers, and building up a strong profile on Amazon. No matter which avenue you take though, giant partnerships like Amazon and Apple are not taking over the third-party seller space. If anything, it points toward these alternative selling options as your best bet to becoming a successful Amazon seller.